Twelve Dancing Unicorns is a delightful and gorgeously illustrated retelling of Grimm's 12 Dancing Princesses. Okay, confession time. I don't actually know that fairy tale! But that in no way prevented me from completely enjoying this charming book. The king has 12 unicorns who somehow magically escape their golden chains each night. The king wants to know how, but his big strong guards can't tell him. So he ends up enlisting the help of a young girl who discovers something very magical about the unicorns, indeed! The writing is very pretty and the words themselves evoke a sense of the magical and unknown. But the illustrations are just stunning, infused with light and charm and really help to make this book stand out. I think this would be a wonderful addition to anyone's picture book collection, young or old! It has important ideas in it, ideas of bravery, courage, and love which are important, I think, at any age! I am lucky enough to have a copy to give away to a US resident. Just fill out the form below by September 16, 2014. Fun little note: As soon as I received my copy of this book in the mail, I realized I recognized the illustrator's name! Any fans of Andrew Peterson must as well! He painted the cover of my very favorite Andrew Peterson album, The Far Country and has illustrated some of his books. I want to give you Andrew's very generous words about Mr. Gerard's art: "It takes a special gift to do more with a picture than illustrate a scene. You could be at the top of your game as an artist in terms of skill and craft, and you could inspire admiration—but it’s another kind of artist who can inspire wonder. It’s a true artist who can make you hungry for beauty the way a the chef in the kitchen can make you hungry for dinner." I do very much enjoy and appreciate the illustrations in Twelve Dancing Unicorns and I do think they are the kind that elevate the book because of how warm and wondrous they feel. Anyway! 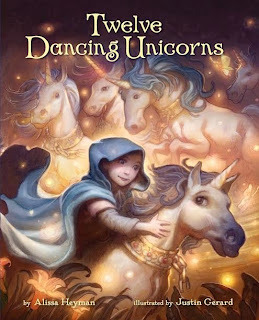 It's always fun to discover these connections, but I know you're going to want to learn more about Twelve Dancing Unicorns. Follow the Twelve Dancing Unicorns blog tour tomorrow on Akron Ohio Moms.